Gajpathi, is one of the poorest districts of Orissa, with 68% population living below the poverty line. The district headquarters is at Parlakhemundi. Gumma is a block with hilly terrain and undulated topography and is inhabited by the tribals (Souras) in most of the villages. Land is one of the major issues of Gajapati particularly in the Gumma block. Most of the area falls under the forest category as per the government records. The tribal people have no record of rights over the land although they are staying there for a long time. Tribals grow a number of horticultural crops (pineapple, oranges, jack fruit, mangos, cashew and lemon). However, they continue to remain poor, despite the fact that these crops have high demand in the cities and have high potential for value addition. Apart from Jhum cultivation, some plain lands are irrigated using small natural springs and/or canals. Mostly paddy is grown on these patches of land. Table 1. Land use pattern in Gumma block. *Much of the horticulture in Gumma is in the designated forestland. Collection of NTFP is an important occupation in Gumma. The land use pattern indicates the predominance to rain fed agriculture to a reasonable extent in Gumma. There is a lack of irrigation water and the average land holding size (0.79 ha) is small. Area under common lands is high in Gumma. This mostly includes forestlands where people cultivate a large number of horticultural crops and collect non-timber forest products. Table 2. Main features of village livelihood in Gumma block. Many people depend on agriculture and a declining natural resource base. The dependence on unskilled labour is high. Migration is an important coping strategy. Though horticulture in forest and collection of NTFPS do provide diverse livelihood options, people sell most of the produce in distress and without any value addition. Poultry and goat rearing are important activities in Gumma. The tribal households have a particular livelihood pattern. They cultivate their traditional pulses and millets in the forest (to which they have informal rights) after burning a patch of land, clearing the rocks and sowing seeds (Jhum cultivation/shifting cultivation). The agriculture is mostly rain fed. They take crop in this land for three years and then move to another patch of land. However, this is carried out strictly in the forestland belonging to that village. During the last two decades, the tribals were growing cashew and it has greatly benefited them. Earlier, the tribals used to sell their products after collecting. With the influence of several NGOs, many of them have now started adding value (tamarind, turmeric, pineapple, jackfruit, etc) by drying, storing and processing e.g. jackfruit and pulses. Livestock includes bullocks, cows, goats and poultry (all at a very small scale and for sustenance in the sample villages). Surrounding the tribal villages, there are pockets of villages with OBC and SC population. These are essentially traders, especially the OBC (mostly telugu-speaking population), who collect forest produce from the Souras and sell it to traders in Gajapati or other districts. These people also sell daily use articles/provisions to the Souras either for money or in exchange of cashew. Others are engaged as drivers, tailors, mid-wives, private doctors, artisans, carpenters, hand-made leaf plate makers, bamboo basket and broom makers. Only a few households have members employed in private or government sector. Gumma has a relatively high incidence of food shortage. Majority of households in Gumma are poor and food insecure. Table 3. Food security Status of Gumma block. The main source of income comes from agriculture (nearly 60%). For 22% of the households, earnings from unskilled labour constitute the main source of income. Most of the unskilled labour from this block migrates mainly to cities outside the state. Table 4. Main source of income in Gumma block. *NTFP and horticulture are generated from forests, but are included under agriculture and horticulture. 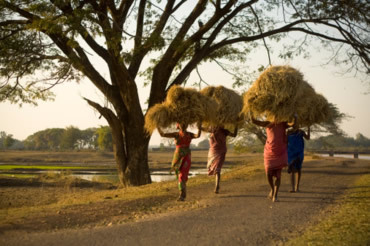 Women are involved in many activities especially in the tribal villages. They go to the forest along with men to gather NTFP, assist them in agriculture activities, attend to their livestock, work as unskilled labourers, run small businesses and take care of the family when men have to go out to work. In several households, men migrated to several south Indian towns in search of work to earn their living. There is chain migration to parts of Arunachal Pradesh (Souras settled there during the time of Maharaja of Gajapati on his tea estates in the state of Assam) as well. Very few women accompany them. Women were organized into SHGs in many villages, and they undertook various business activities to add to their incomes. Vehicles purchased by households or self-help groups are rented to make additional income. Table 5. Women’s livelihood profile in Gumma. 1. Women engage in multiple activities would get counted against each activity. 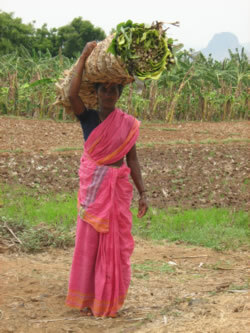 Most of the women are engaged as agricultural labourers. Collection of forest products including NTFPs and engaging with livestock are second and third important activities. Women labourers and those engaged with livestock should be the major clients of future agricultural programmes. Women have multiple aspirations. The study revealed that all of them want to improve their standard of living and have a good quality of life. Those who could articulate their aspiration, talked about constructing a better house and providing better education to their children. Except for the few women who are constrained by caste, occupation and religious constraints, all of them want to improve their income by engaging in some of the activities/occupations, which they currently see as relevant. Though many women in all the locations are keen on starting some non-farm business activity, none of them was able to suggest the kind of support and services they require for doing the same, except credit. All believed that if they could get credit, they could engage successfully in these activities. This clearly reveals their lack of experience of setting up new activities and also the lack of awareness and knowledge about other kinds of services and support (technical training, entrepreneurial skills, market links etc). The final step of stage 1 was to collate information and details of the support and service networks available in Gumma block. Table 7. Support and Service Network in Gumma block. A large network of traders and commission agents engaged in marketing cashew, fruits and NTFPs. More number of people from the area are currently becoming traders. Table 8. Location of Individuals and Organisations in Gumma block. Table 9. Distance to key facilities in Gumma from select villages. Agricultural labour households do not have round the year employment and so enhancing their capability to use their labour productively in the lean seasons can improve their incomes. In Gumma, land based activities are not considered important by the women. Non-farm activities, especially doing some business, are considered by the communities as a good option for improving current incomes in Gumma. Most of the women-specific programmes, assume that more programs should be initiated for women in agriculture, considering their multiple involvement in agriculture. 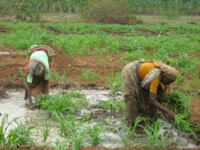 However, the communities do not consider farming as the best option to improve their incomes.